A Traditional Life Lived: Kideny Update: This time it was EXCELLENT news! 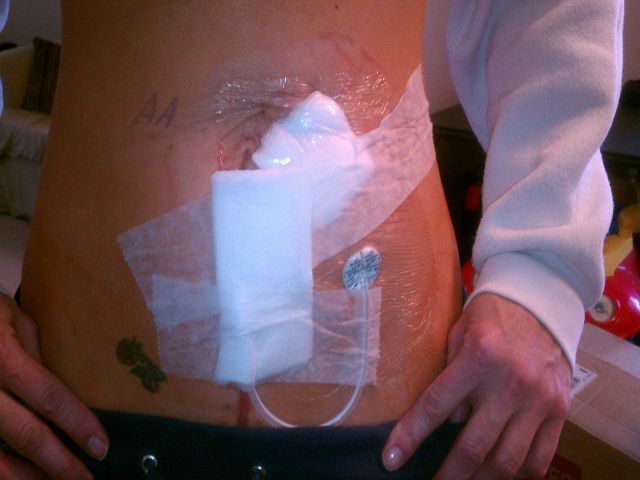 I just returned from having my PD catheter placed in my abdomen. If you're following the saga you know there was some question as to whether I would be able to have it because of the many abdominal surgeries I have had over the years. As it turns out, there was no issue getting the catheter in the abdomen. It went right in, followed the path the doc wanted it to and the abdominal cavity is NOT divided into pockets. I go back Monday to get the sutures out and then I will get the tubing flushed once every 7 days until I start dialysis. At this time the doc seems to feel I will heal quickly and I should start dialysis in possibly two weeks. Once the bandages come off I will post another pic of what it actually looks like. The surgery was not terribly painful. They didn't knock me out but rather gave me something to relax and then numbed the area with lidocaine. There were a few times it was very uncomfortable, hurt a little and at one point-though I was totally numb-I could fully feel him reaching around inside my abdominal cavity and touching stuff.......it didn't hurt all that much, but it was a very disgusting and disturbing feeling. The surgery took about 40 minutes. So the journey thus far has had some bumps. There are days I am very depressed and there are pressures I wish I didn't have, but today I am grateful. I am very happy that I am able to at least begin with the type of dialysis that, for me, will be the better choice. Thanks again for all your prayers......today they were answered! This is the kind of news I like to hear. Prayer works. Great to Hear Rambo Hang in there! Thank you Lord... Glad it went without a hitch.. I did PD for a little over 2 years, then I had to go back to Hemo. Trust me, PD is a MUCH better option. Takes a while to get used to sleeping with the tube but sure beats going to a clinic. I find them SO depressing. SO glad to hear prayers were answered and it went well! I'm betting you'll feel 1000% better once you've been thru a round or two of dialysis!! You're on the mend! Looking forward to having you back to full strength and health!